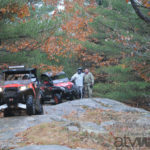 ATV and Side X Side season is actually winding down here in Ontario and the upcoming snowmobiling season is starting to gear up. It’s probably one of the few times, over the course of a year, that a lot of us can actually get our calendars in line and get out for a large, end of season group ride. Seems if you try to put together a ride now days all I hear is my wife, my kids, hockey, work, and hunting…… you get the idea. So when an opportunity presents itself I suppose you have to run the yellow light. The gang I described above would be more accurately describe my usual sled gang. There are a few of us who do double duty and multi task in our motorsport hobbies and we have definitely gravitated towards the side by side genre. 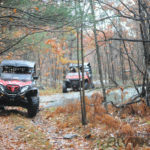 Some of the lads heard us talking about setting up this last ride of the year and how we wanted to tackle our favorite trail. I have come to calling it the Ontaricon trail. Kinda like Ontario’s Rubicon trail. Now I’ve never been on the Rubicon trail (attention Editor Kehoe), so no disrespect intended, this could really be a wannabe trail in comparison. 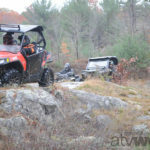 But with local jeep clubs calling it the Hell Trail and off road board sites talking about people spending unexpected nights in there, it is in the same discussion I’m sure. Any route that has as many busted up trailers, parts and even a brake caliper in a tree deserves its name. The actual entry into the trail starts on the North East corner of Lingham Lake. Lingham is a large uninhabited lake located East of Hwy 62 and north of the Belleville/Madoc area. It has been accessed for years by a very rough 4×4 road from the south. Fishing is rumored to be very good in this lake and last season my son and I did an overnight RZR trip to the lake to check it out. While doing the research for that trip and how I would access it for that function, I found some web pages that listed a trail that went down the east side of the lake. Most of the information laid it out as very technical, and if the water was high, virtually unpassable. We have actually done it twice in the side x sides, Once in mid high water and once at low water. There is actually a way around anything that poses an obstacle. It might not be a short route, but it’s at least a route. It is really hard to picture a full size jeep in there, but I’m sure it happens. It’s a ton of fun in a side x side and you can move at a decent clip and not ruin anything with a little caution and thought. 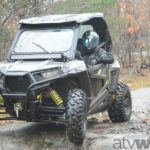 Perhaps it is not so technical on a traditional ATV, but still quite a challenge. This trial will serve as a fantastic introduction to the newbies of our group in the passenger seat of our rides. There is a bit of road running to be done to access the trail. We started basically form HWY 62 and West settlement Rd and ran up the Heritage trail until we got to the snowmobile trail #961 east. That took us up to Wadsworth lake and where we would begin to go south on Skootamata lake Rd. It’s really the only road south of Wadsworth Lake. Follow that county road south until the hydro corridor and then you need to take the next right turn (east). Follow this rough road until its end and there is access to the trail head on the right side. I believe the left fork goes to a private hunting camp. What will you see on this trail? Well it starts with some good forest roads, nothing to rough our outrageous but as the road gets longer, the road gets thinner and it gets very tight, technical, rocky, hilly, wet, lumpy and all the while it is beautiful and amazing. There are no houses, driveways, hydro lines or cell service in there; it’s pretty much nowhere East Central Ontario. There are a couple really nice rock crawls and descents, rough forest roads, swamp avoidance maneuvers and not a lot of evidence of vehicles using this route a lot until further south. A GPS unit is a very handy unit to have for this trip as it will keep you going the right way using the lake as your guide. Especially if you reach a high water roadblock and have to go out of your way to get around. Once down the length of the lake pretty much any trail to the right (west) will take you to the Lingham Lake access road. If it turns out you miss them, and I have before, you will dump out on a rough gravel Hydro road. A quick right turn (west) and 5 minutes down that will get you to the head of the Lingham road. A run up this road is highly recommended. There’s lots of water on this road, some deep, some not so deep, but all holes will make you stop and look. 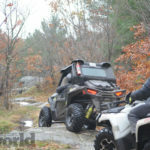 Most are passable for ATV’s although you might get a wet bum in the side x side if the water is high. You will experience a river crossing located with a chicken bridge half way up. If you do go thru the river, there is a large rock in the direct, straight line route between the two landings. Veer to the left, downstream, and then turn right to cross safely. 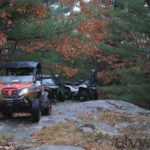 After that you will experience something every off road enthusiast should mark off the list. Johnson’s Hole. Rumors had it its named after some poor sole that didn’t make it out of that hole, but I can’t confirm that. There’s usually a local group splashing around in there and chicken routes are evident on the east side. Rule of thumb here is anything to the west of the thru path is trouble and anything to the east is passible. The main straight thru road might look out of the question, but it might be the better route, just stay to the right, the left side is deep. Tread lightly on the paths to the east or west side, they all look the same but some you will have fun in and some you will disappear in. Don’t charge in any quickly, some end in vertical escape walls. If you get out of Johnsons hole the road up to the lake tames down a bit. Sure it’s rocky and rough but easily passible thru some really nice forest and dumps out at the south end of the lake on a sand beach and river dam. Although the lake is extremely beautiful the area around here has been accessed and abused for many years and it really shows. Please, don’t leave anything there that shouldn’t be. I suppose the drawback of going up the road is that you have to go down it to get out, but there is usually another entertaining group at Johnsons hole by then to check out. After exiting the trail you’ll want to travel west and this will lead you out of the Hydro corridor and towards hwy 62. You will pass a Buddhist Temple on the way……Yup, you read that right, it’s a Buddhist temple out there???? 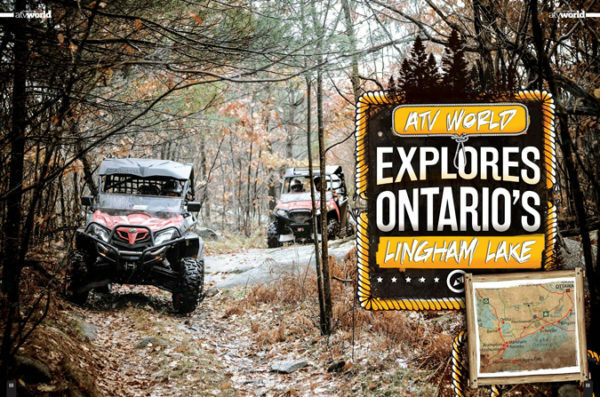 Lingham lake road will bring you back to the Heritage trail North or South to get you back to your starting spot. There is a few decent parking spots in the Town of Gilmour and at a Gas Station called Trudy’s on Hwy 62 that can be used for day trips. All in all the loop is around 110 to 130 kms long and will take you most of a day to do depending on how much water you experience and how fast you move. If you’re looking for accommodations in the area our friends at Limerick Lake Lodge are just about 10 k from the North east trail head and you could access the Heritage trail not far from their resort. Maps of this area are hard to find and we used Google maps for most of our information. I would suggest at least checking out the maps there to be safe and take that GPS to keep you on track. And if anyone attempts this route, please contact us and let us know what you thought of it or if you GPS mapped it. We would love to hear from you. Be careful with Johnson’s hole there have been alot of jeep and trucks playing in there for years. At one time an ATV was fine to go through anyway you chose, but this mud bog has since been torn up with bigger vehicles and is quite deep in many areas! Also at the south trail access you will be at the end of lingham lake road if you continue straight on the hydro line it connects out to hwy 41 and you will end up in the small town of cloyne. You will pass through 1 private land section sometime the gate Is open and sometimes closed but I’m sure if u leave no trace the owner would likely be ok with you passing though. From cloyne you can head to the east side of 41 just outside of bon echo park and follow up to venachar denbigh area where the municipality has many trails and allows you to drive on roads to trail heads from lingham lake to venachar is about 130 km it can be a rough ride and you will need to alot 6-8 or so hrs to ride from a-b the madawaska area you will have reached has many trails lakes and beaches to camp out for a night or 2 before heading back down so trails and accesses can be hard to find but they are there. I own land on Hell’s Run (trail) near the bottom end. A very challenging piece of Canadian Shield. The hydro road has been improved in the past few years by Hydro One so if your tires ca take the 4″ sharp rock on it you can drive from Hwy 62 to Hwy 41 now.